The public's love affair with the Poodle is one of the worst-kept secrets in the dog fancy. Whether you prefer them little or large, this breed has been a mainstay in the list of the top ten favorite dogs for decades. Head: The head is fairly rounded with flat cheeks and a little chiseling under the eyes, and a long muzzle with a slight but well-defined stop. The ear leathers are fairly long and hang down. The bite is scissors, which means the top teeth close just in front of the bottom teeth. There should be just enough chin to keep the muzzle from looking snipey. The eyes are dark, oval and should display and alert expression. Body: The head flows into a long neck and strong shoulders. The chest is deep with well-sprung ribs. The back is just long enough to create a square outline with the length of the legs. Legs and feet: The front legs are straight with strong pasterns. The rear legs have sufficient angulation to balance with the front legs. The feet should be well-arched with thick pads and form a tight oval. Splayed toes would be considered a fault. Tail: The tail is set high and is carried up. It's fairly straight and is typically docked to length the helps create a balanced outline. Puppy Trim - The hair is trimmed close over the entire body with the extra fluff kept on the head, ears and part of the tail. English Saddle Clip - This is a longer but slightly more tailored version of the puppy trim that strategically removes hair from a few areas on the back and legs. The Continental Trim - Developed to best fit the breed's water retrieval use, areas of the head and joints are grown long and full to protect internal organs and joints from cold, while unnecessary hair is removed to help the dogs move more freely in the water. Some shading is permissible in the lighter colors. Except for size, each of these varieties should be of the same type and personality. Poodles are loving, outgoing, intelligent dogs who are always up for adventure, but they love snuggle time, too. They make wonderful family pets and are good with children, so you can basically decide how much dog you can accommodate and choose your preferred variety. You really can't put a limit on what you can train a Poodle to do because they are so intelligent and cooperative. House training is relatively easy, and obedience and agility trials are filled with top-performing dogs of this breed. These fluffy dogs also make terrific guide dogs for the blind, as well as therapy and search-and-rescue dogs. If you can think of a use for these dogs, you can likely train them to it. Poodles require quite a lot of grooming to keep their coats in good condition. 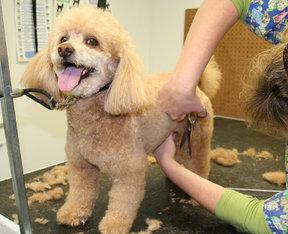 Most owners opt for a regular trip to the groomer about twice a month. Do-it-yourselfers can expect to brush every other day, bathe once a week and give a clean-up trim twice a month. A bargain Poodle is no bargain at all. The price for a well-bred, fully-examined and tested dog seldom dips below $1,000.00, mainly due to assurances that you're getting a quality dog with no serious health issues that can plague poor-quality Poodles. Subaceous Adenitis (SA) - A skin disorder evidenced by foul-smelling, crusty lesions and hair loss, it can be diagnosed with a skin punch sample. However, dogs who have tested clear for years can suddenly develop the disease. Treatment mainly consists of management, with no current cure. Von Willebrand's Disease (VWD) - A blood disorder similar to hemophilia, VWD is currently untreatable, but it can be diagnosed with a blood test before or after onset. Hip and Elbow Displasia - A crippling malformation of the ball and socket joints that is detectable by X-ray, surgery may be helpful in some cases. Progressive Retinal Atrophy - Also known as PRA Blindness, this is a degenerative disease of the optic nerve. Boat/Torsion - This is a painful twisting of the stomach that cuts off the blood supply and locks digestive acids, food, and gases into the stomach which then bloats like a balloon. The cause is not completely known, but treatment usually involves surgery to prevent death. A responsible breeder has her work cut out for her, and will usually give you a genetic health guarantee on your purchase. 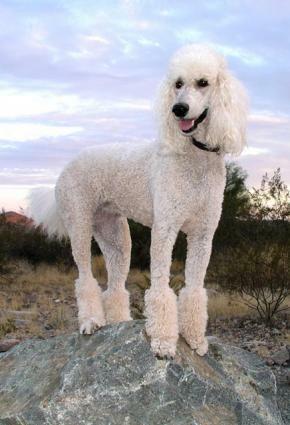 Poodles were originally developed as water retriever dogs in Germany in the 19th century. The early popular name of French Poodle is inaccurate, even though the French did take the breed to heart. This utilitarian purpose for the dog greatly influenced the development of this breed's most recognizable attribute - its coat. Is a Poodle the Dog for You? 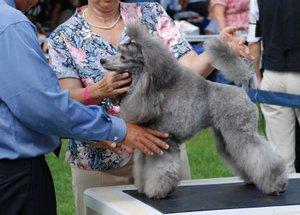 Whether you want a devoted family pet or champion show dog, the Poodle is a good choice for most families. With three sizes to choose from, this dog is truly an all-around, wonderful canine companion.